The GSAT-18 spacecraft project will require a total budget of Rs. 1022 crore including launch services. All heritage proven bus system will be used to build the satellite in 30 months period. The satellite structure will be similar to the GSAT-10 satellite. The GSAT-18 spacecraft will provide replacement capacity supporting the existing television, telecommunication, Digital Satellite News Gathering (DSNG) and VSAT services in the country. The GSAT-18 spacecraft will also augment and support the existing telecommunication, television, DSNG and VSAT services in the country, hence benefiting all sections of society. The proposal to build the GSAT-18 is part of the Indian Space Research Organisation’s (ISRO) efforts towards protecting services of existing users. The Union Cabinet, chaired by the Prime Minister Shri Narendra Modi, has given its approval for building of the GSAT-17. This is a communication satellite, weighing about 3425 Kg, for providing replacement capacity and in-orbit back up. The GSAT-17 spacecraft project will require a total budget of Rs.1013.20 crore including launch services. All heritage proven bus system will be used to build the satellite in a period of 30 months. The satellite structure will be similar to the GSAT-10 satellite. The GSAT-17 will provide replacement capacity in different frequency bands and protect operational services. 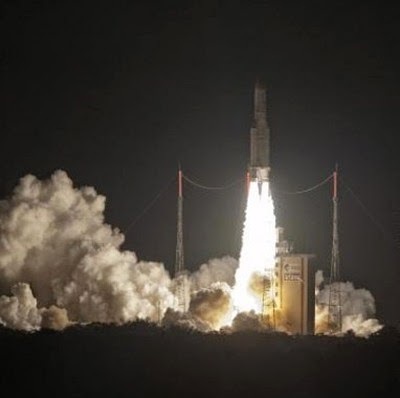 The GSAT-17 spacecraft will also augment and support existing telecommunication, television and VSAT services in the country, apart from providing in-orbit redundancy for societal services. This would, therefore, benefit all sections of society. The footprints of the GSAT-17 spacecraft would cover the entire mainland of the country. The proposal to build the GSAT-17 is part of the Indian Space Research Organisation’s (ISRO) efforts towards protecting the services of existing users and also building in-orbit spare capacity to meet contingency. The scheme of village to village survey for recording and documenting the antiquarian remains and archaeological sites by the ASI has been revived since April, 2014.The scheme does not cover relocating antiquarian remains. Under the village to village survey by ASI Circle Offices, the number of villages surveyed were 1980 and the number of villages yielding antiquarian remains is 822 for the period April, 2014 to March, 2015 . The data is maintained by the respective Circle offices as well as Director General’s Office, New Delhi. At present there is no such scheme for conservation and protection of these antiquarian remains. This information was given by the Minister of State for Tourism(Independent Charge), Culture(Independent Charge) and Civil Aviation, Dr Mahesh Sharma in reply to an unstarred question in Rajya Sabha today . As per request from Ministry of External Affairs, has taken up conservation work of Ta Prohm temple in Cambodia, Vat Phou temple in Lao PDR and supervision for restoration work of Thiruketeeswaram temple in Sri Lanka where work is being executed by College of Architecture and Sculpture, Mamallapuram. The work at Ta Prohm includes restoration of Hall of Dancersalongwith other repairs and at Vat Phou it comprises conservation and restoration of two Quadrangle buildings in the temple complex. At Thiruketeeswaram it is restoration work of Mandapas. All these works are in progress. In addition the preliminary proposal for conservation of Pashupatinath Temple at Kathmandu has also been prepared. At present, no such proposal is there to connect all museums in India and aboard. However, to facilitate research studies in major museums, Tagore Fellowship is awarded. The material related to Indian culture, history, art architecture and archaeology is displayed by major museums on their websites. This information was given by the Minister of State for Tourism(Independent Charge), Culture(Independent Charge) and Civil Aviation, Dr Mahesh Sharma in reply to an unstarred question in Rajya Sabha today. The Directorate General Resettlement (DGR), Department of Ex Servicemen Welfare (ESW), Ministry of Defence (MoD) under the aegis of Western Army Command conducted its institutionalized Job Fair, here today at NCC Parade Ground, Delhi Cantt. The event was marked by the presence of Shri P D Meena, Secretary, Department of Ex-Servicemen Welfare, Lt Gen KJ Singh GOC-in-C, Western Command, Maj Gen Amrik Singh, Director General (Resettlement) and other senior officials from services and corporates. Confederation of Indian Industry (CII) and National Skill Development Corporation (NSDC) partnered for the event. The especially designed DGR job portal for online registration of ESM/retiring servicemen and the prospective employers facilitated in the registration process. Besides online registration, on the spot registration was also available catering to those who turned up without registration. Approximately 5000 Ex-servicemen registered for the event on first day and participated in the job fair rendering it a huge success. About 200 recruiters, such as, Tata Sons, Amazon, Reliance Insurance, DHFL Insurance, Safal, Mother Dairy, RailTel Corporation of India, Magic Sewa etc. participated in the event offering nearly 4000 job vacancies. The jobs offered were technical as well as non-technical. The Job Fair also provided an opportunity of counselling sessions on CV preparation by professionals. The participating corporates were provided facilities for on the spot trials/ tests, aptitude tests if required, and cabins for personal interview. Additional highlights during the Job Fair included branding of various entrepreneur schemes by corporate including Tata Motors, Magic Sewa, RailTel Corporation of India, Broadband Services and Amazon. During the fair, HR heads of the corporates were briefed on the competencies of the ESM which includes interactions. The Job Fair conducted by DGR has been the outcome of pro-active approach of the Directorate towards bringing ESM closer to the prospective employer. It is expected to provide adequate opportunity to ESM for smooth transition to second career in the corporate world. The fair will culminate on 07 May 2015. The Union Cabinet chaired by the Prime Minister, Shri Narendra Modi today approved the operationalisation of the Atal Pension Yojna (APY), Pradhan Mantri Jeevan Jyoti Bima Yojana (PMJJBY) and the Pradhan Mantri Suraksha Bima Yojana (PMSBY). Approval of the Cabinet was given to extend funding support for implementing the APY and apprise the Cabinet on operationalisation of the PMJJBY and the PMSBY. Approval was also given to provide Rs. 50 crore per annum for the next 5 years as the Government contribution for publicity / awareness creation related expenditure for PMJJBY and PMSBY. Under the APY, subscribers would receive a fixed minimum pension of Rs. 1000 per month, Rs. 2000 per month, Rs. 3000 per month, Rs. 4000 per month, Rs. 5000 per month, at the age of 60 years, depending on their contributions, which itself would vary on the age of joining the APY. The Central Government would also co-contribute 50 percent of the total contribution or Rs. 1000 per annum, whichever is lower, to each eligible subscriber account, for a period of 5 years, that is, from 2015-16 to 2019-20, to those who join the NPS before 31st December, 2015 and who are not members of any statutory social security scheme and who are not Income Tax payers. The pension would also be available to the spouse on the death of the subscriber and thereafter, the pension corpus would be returned to the nominee. The minimum age of joining APY is 18 years and maximum age is 40 years. The benefit of fixed minimum pension would be guaranteed by the Government. Under PMJJBY, annual life insurance of Rs. 2 lakh would be available on the payment of premium of Rs. 330 per annum by the subscribers. The PMJJBY will be made available to people in the age group of 18 to 50 years having a bank account from where the premium would be collected through the facility of "auto-debit". Under PMSBY, the risk coverage will be Rs. 2 lakh for accidental death and full disability and Rs. 1 lakh for partial disability. The Scheme will be available to people in the age group 18 to 70 years with a bank account, from where the premium would be collected through the facility of "auto-debit". Government expenditure is expected to range between Rs. 2,520 crore and Rs. 10,000 crore on account of Government co-contribution to subscribers of the APY over a period of five years. Further, an expenditure of Rs. 2,000 crore for promotional and developmental activities for enrolment and contribution collection under APY and Rs. 250 crore for publicity, awareness building for PMJJBY and PMSBY is envisaged by the Government, over a period of five years. It is expected that around two crore subscribers would be enrolled during the current financial year under APY. It was mentioned in the Budget Speech for 2015-16, that a large proportion of India’s population is without insurance of any kind, that is, health, accidental or life. Further, as the young population of India ages, it is also going to be pension and insurance- less. Therefore, Government has decided to work towards creating a universal social security system for all Indians, specially the poor and the under-privileged, to address longevity risks among workers in the unorganised sector and to encourage workers in the unorganised sector to voluntarily save for their retirement. Such workers constitute 88 percent of the total labour force of 47.29 crore according to the 66th Round of NSSO Survey of 2011-12. The revised Double Taxation Avoidance Agreement (DTAA) will provide tax stability to the residents of India and Korea and facilitate mutual economic cooperation as well as stimulate the flow of investment, technology and services between the two countries. The revised DTAA provides for source based taxation of capital gains, provisions for making adjustments to profits of associated enterprises on the basis of arm's length principle, provides for residence based taxation of shipping income, provisions for service of permanent establishment, rationalizes tax rates in the Articles on Dividends, Interest and Royalties and Fees for Technical Services. The Agreement further incorporates provisions for effective exchange of information and assistance in collection of taxes between tax authorities and also incorporates limitation of benefits provisions, to ensure that the benefits of the Agreement are availed of by genuine residents of both countries. There are 162 monuments/sites including forts and palaces declared as of national importance under Archaeological Survey of India in Rajasthan. Besides, 378 monuments/sites in Rajasthan have been declared protected by the State Government of Rajasthan. The additional monuments identified in Rajasthan for declaration as monument of national importance under the jurisdiction of Archaeological Survey of India include Rambagh Palace, Deeg, District Bharatpur ; Sitaram Ji temple, Deeg, District Bharatpur ;Step well at Neemrana, Beharor, District Alwar ; Raja Rai Singh Ka Mahal, Toda Rai Singh, District Tonk ; Ramchandra Temple at Rohida, District Sirohi ;Ancient Site at Vasantgarh, District Sirohi and Ancient Zinc Mining Site, Zawar, District Udaipur. The Earth System Science Organisation (ESSO)-India Meteorological Department (IMD), New Delhi which is the national agency for issuing long range forecast for the country had predicted that the monsoon seasonal rainfall is likely to be 93% of the Long Period Average (LPA) with a model error of ± 5%. The LPA of the season rainfall over the country as a whole for the period 1951-2000 is 89 cm. Seasonal forecasts for the southwest monsoon season (June – September) rainfall are issued in two stages by the IMD. The first stage forecast is issued in April and the second stage forecast is issued in June. Along with the update forecast, separate forecasts for the month (July and August) rainfall over the country as a whole and seasonal (June-September) rainfall over the four geographical regions of India will also be issued by the ESSO-IMD in June, 2015. The Minister said that various research Institutions in the country engaged in forecast/ research on monsoon as given below. The Minister said through Indo-US collaboration, a “Monsoon Desk” has been set up for working jointly for improving seasonal forecast of Indian monsoon rainfall. Through this forum, Indian and US Scientists are exchanging their ideas and sharing their expertise. This effort has led to appreciable improvements in the efficiency of models in making better and better forecasts, he added.